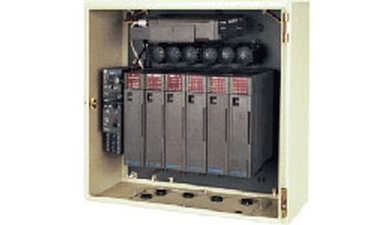 Motorola's MOSCAD RTU, using the MDLC protocol based on the recommendations of the International Standards Organization, provides extremely reliable communications as well as several features which are often found only in wireline systems, such as remote diagnostics, remote programming of RTUs, RTU-to-RTU communications, broadcast calls, and store-and-forward operation. MOSCAD RTUs are also capable of communicating to other devices using several other non-Motorola protocols. Virtually limitless in I/O capability and communication mediums, this RTU provides the optimum solution for radio based SCADA systems. Allows for easy system configuration optimization according to the specific and unique requirements at your particular site. A large selection of plug-in I/O modules allows you to configure each remote site to run the specific applications you need. Functions as both an RTU and a Programmable Logic Controller (PLC). If the application loaded into the CPU module is simple, then MOSCAD functions as an RTU; if the application utilizes a decision-making code, then MOSCAD functions as a PLC. Connects directly to VHF, UHF, 800 and 900 MHz trunked and conventional radios, Private DataTAC modems, iDEN, TETRA, GSM, Power Line Carrier Communication (PLCC) modems, Multiple Address System (MAS) data radios, and Spread Spectrum radios. Our specialized I/O modules provide connectivity to both digital and analog sensors. The MOSCAD family of RTUs is capable of communications with other vendors' PLCs, IEDs and RTUs by utilizing MODBUS, Allen Bradley DF/1 and other protocols. MOSCAD allows you to integrate new SCADA systems or expand existing ones, utilizing your current communication media, Master Control Center (MCC) software, and the most suitable data protocol. MDLC, a modern and powerful data communications protocol, is based on the International Standards Organization's seven-layer protocol recommendation. It was created to be particularly robust on crowded, shared, two-way radio communication circuits. Its seven-layer OSI/ISO-compatible structure allows powerful networks functions.